But the game I’m talking about is chess, which can help make any kid smarter, not just at-risk kids or kids from low-income families. That’s right. While a lot of people think only smart kids can play chess, the truth is that being a regular chess player can actually make a kid smarter. Still, the most eye-catching stories are about the amazing impact chess is having on underprivileged kids. I’ve written about one of these. The school systems in Brownsville, located in one of the most impoverished areas of Texas (a third of the population is not fluent in English), support chess programs that have won elementary, middle-school and high school championships at the state and national level. School officials claim that playing chess has boosted students’ self-confidence and developed critical thinking and memory skills. They point to improvements in academics and higher state standardized testing scores. Another example is Intermediate School 318 in Brooklyn, New York, which Paul Tough, in his book, How Children Succeed, calls “the best middle school chess program in the United States, bar none.” These kids beat teams from the most prestigious schools in the country, at all three grade levels of middle school. Tough devotes one of his five chapters to telling the story of this program, a chapter aptly titled, “How to Think.” According to Elizabeth Spiegel, the school’s chess teacher and team coach, “Teaching chess is really about teaching the habits that go along with thinking.” She also stresses grit, curiosity, self-control, and optimism in her instruction. But only a few thousand kids have had the opportunity to participate in these two chess programs. 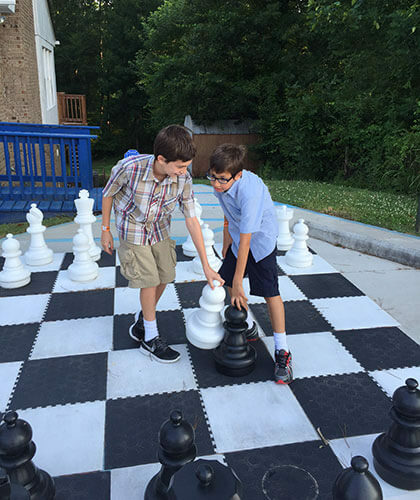 What if you’d like your child could learn to play chess and become smarter and strong for life in the process? Does your school system support an active chess program? How can your child learn to play? What’s the best book for kids that teaches chess fundamentals? The answer: One Move at a Time: How to Play and Win at Chess…and Life!, by Orrin Hudson. Hudson affirms that chess teaches kids to be critical thinkers. His goal is to help youth become smarter and wiser, avoid trouble, and make smart life decisions. Written for kids, his book is the best introduction to chess I’ve ever seen. In ten chapters, Hudson starts with naming the pieces and explaining the game, which is actually very simple, and slowly introduces the fundamentals of winning. I’m a self-taught chess player, and I have to say I learned more in the first five chapters than I learned by being a casual player these past 50 years. In the simplest terms possible, he hands over the keys to winning at chess. The rest of the book is about 20 life lessons that chess teaches: learn from successful people, associate with winners (not losers), learn and practice the fundamentals, visualize, focus, think ahead, plan, don’t quit, think about consequences, learn from failure, and more – awesome life lessons, each described in a page or two. If you want to introduce your child to chess, get this book. And read the book yourself; you’ll want to learn or retool your game by playing chess with your child. The author, Orrin Hudson, is an uncommon man. He told me that in middle school, he fell in with the wrong crowd – older kids who used him to commit crimes. He was put in a foster home, and in high school, he found a mentor who taught him to play chess. After graduation, he enlisted in the Air Force. He became a State Trooper, then started a body shop business. Along the way, he won chess championships around the world. Today he is the founder and driving force of the “Be Someone” youth development program, which teaches chess to underprivileged kids. Over 60,000 young people have learned chess basics and life lessons from this charismatic teacher. Going forward, Hudson is planning to establish ongoing programs in major cities, based on the Atlanta model. You can view videos of his media appearances. His goal: transform the lives of a million young people. Learn more about it at www.be someone.org, and consider donating your time, influence, or personal resources. Many more ways for young people to build brainpower described in Chapter 8 of my new book: How Your Teen Can Grow a Smarter Brain.